Congratulations to the University of Delaware’s Lady Blue Hen golf team for qualifying for the NCAA Regional of the NCAA Women’s Golf Championships, to be held May 5-7 in Bryan, TX. In only the fifth year of the team’s existence, UD qualified for the national tournament by winning the Colonial Athletic Association championship April 15-17, at the St. James Plantation in Southport, NC. They join seventeen other teams in Texas, along with six individual golfers from other schools. The low six teams and three top-scoring individuals not on those squads advance to the national finals, held May 20-25 at the Eugene Country Club in Eugene, OR. 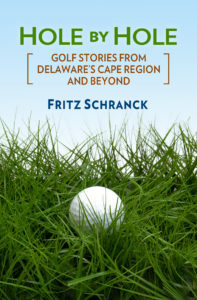 Naturally, some of us are inclined to think that the Lady Blue Hens’ invitational tournament held at Rehoboth Beach CC in October has had something to do with the team’s progress. The Cape Henlopen High School golf team doubled their win totals for the season, with victories over Sussex Central and Smyrna in a tri-meet April 26. The Vikings won against Central 193-203, and against Smyrna 193-220. Junior Matt Zehner won medalist honors with his 43. “It was really windy, and there were those little helicopter things all over the greens,” he said. For those not from Delaware, that’s what the locals call maple tree seeds. Senior Jack Ashby played his first match of the 2016 season, after nearly completing his recovery from an indoor soccer injury. “My ankle’s better, but it was a little sore from walking around,” he said. Ashby’s 47 was a good start to his final year with the Viking squad. Sophomore Mike Bollig shot a 49 for his second match of the season. The Illinois transfer student had never seen “those helicopter things” when playing in the Midwest. “I played pretty good. I hit 8 of 9 fairways, and missed a hole in one [on the 8th hole] by two feet. I missed the putt, but made par,” Bollig said. The double victory was a nice bounce-back from the April 18 tri-meet at Rookery North, where the Vikings lost a close match to Milford, 202-194, and to Concord High School of Wilmington, 199-202. Dane Palmer posted a 54, with Bollig one stroke back at 55. Barry Staebler’s 56 completed the Viking scoring for the match. The first big tournament of the 2016 Delaware State Golf Association season enjoyed great spring weather at Rehoboth Beach Country Club April 25, with 112 players competing in the day-long Pro-Am. New assistant golf pro Zac Oakley, of Heritage Shores Club in Bridgeville, tied with Michael Tobiason for first place in the Pro Division. Both won $350 for their four-under 68s. Kings Creek Country Club’s teaching pro, Chris Krueger, won third place. In the net team category, County Bank’s Joe Shockley, his son Scott, Shane Smart, and Heritage Shores head golf pro Brooks Massey won with their 14-under 58. One stroke back, second place went to Gerry Desmond, Paul Cowan, Joe Crispin, and pro Dustin Riggs, with third place won by Mike Georgules, Steve Haass, Matt Addonizio, and pro Randy Hambrick. In the golf superintendent category, the Rookery team of Mike Pyne, Dave Pyne, Terry Johnson, and pro Kyle Deas won first place with a net 64. Ed Brown won the day’s closest to the pin competition on the 19th hole, with an approach of 2 feet 8 inches. Each team in the annual Horsey Family Youth Foundation Celebrity Golf Classic will have an extra celebrity player joining them on the links May 26, at Heritage Shores Golf & Country Club in Bridgeville. Leading the celebrity line-up are Philadelphia Eagle Fred Barnett and New England Patriot Stanley Morgan. The celebrities will also be on hand May 25 for the evening hour meet and greet, dinner, and live and silent auction. The next day is the golf tournament, including chances to win in the special putting contest and a long-drive competition. The Foundation serves Delmarva youth with education and athletic programs. For more information about the dinner and/or playing in the tournament, contact Dale Webb at 302-841-5120 or 302-875-3033. The Kings Creek Ladies 9 Hole group played a Low Net game April 20. Susan Eisenbrey won first place, with Mary Metzger in second, Kathy Nave in third, and Rita Musi in fourth. Carole Ellison won the closest to the pin contest on the sixth hole. The Kings Creek Ladies 18 Hole group played a Baker’s Dozen game April 26. Only the net scores from the golfer’s best 13 holes are used for the total. Marilyn Hewitt won first place in the first flight, with Faye Slatcher taking second. Sheree Mixell won the second flight, with Arlyce Dubbin in second. The Sussex Pines Ladies 18 Hole golf gang played a low gross/low net game April 26. Brenda Lewis won low gross, with Joann Foster in second and Sue Brady in third. Carol Love won low net, while Sandy Harrison took second and Hazel Pusey finished in third.